Viola—no longer a child, but not yet an adult—ponders life’s big and small questions. Her thoughts and emotions evolve around friendship and the fear of being ostracised. Around the trouble with her family, love and the support that comes with it. Around boys, looks and recognition, around achievements and setbacks. And the Where From and Where To, around life and death. And over and over again the question: Who Am I, Really? Author and illustrator succeed in unfolding the young girl’s entire cosmos in twelve episodes and a unique interplay of text and images. This is done with great stylistic and artistic variety. Pages like a pin board with old photographs and a lock of hair, scribbled notes and romantic glossy prints render Viola’s world palpable. 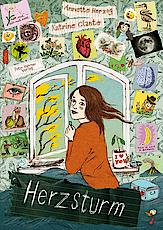 Comic panels observe her in daily life, a school essay and diary entries make her thoughts readable. Whether childishly naïve or philosophically clever—Viola’s thoughts and feelings are just as deeply felt and as disturbing as this entire period of coming-of-age. An exhilarating book!